Crafted soy candle. The Glade Atmosphere Collection: A line of multi-layered artisanal home fragrances masterfully created to express who you are in your space. Our crafted soy candles unleash the power of fragrance to the fullest, providing you a rich fragrance experience. 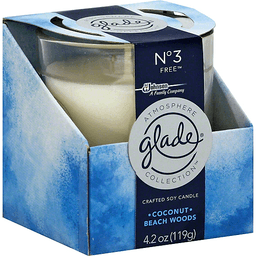 The Glade Atmosphere Collection. Say who you are with fragrance. Relaxing. Sweet as a day off. Care free as a bikini. Starfruit, beach woods and coconut in a heady, creamy cocktail. Feels like freedom. See bottom panel for safety information. SCJ Formula No. 35-30866. 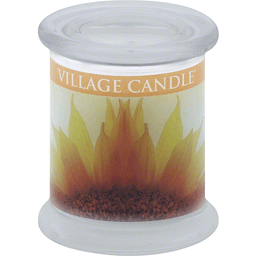 This candle is a blend of soy and paraffin waxes. Environmental Facts: Paperboard packaging is recyclable. Paperboard packaging contains 30% post consumer recycled material. A family company since 1886. - Fisk Johnson. Visit us at www.Glade.com. Questions? Comments? Call 800-558-5252 or write Helen Johnson. Candle made in Canada. 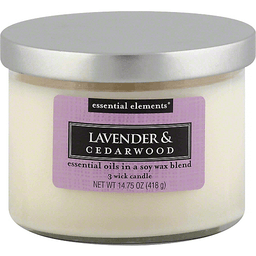 Essential oils in a soy wax blend. Approx. burn time 25-45 hours. Wick contains no lead. Facebook. www.candle-lite.com. Made in USA with USA & foreign parts/materials.